Blowing away the backlog: New mobile forensic system lets correction officials cut mobile phone processing backlog, gain fast access to critical gang intelligence. The Tennessee Department of Correction had a mobile phone problem. Until April 2017, they relied on one employee to extract data from seized contraband phones from 10 correctional facilities spread across the state. Backlogs were high, processing slow, investigations impeded. But that all changed in early 2017, with the rollout of a new mobile forensic system from MSAB, using eight specialized extraction Kiosks and five PC-based XRY Office software applications. Twelve investigators have been trained to handle all extractions and analysis of phones in the field without having to use a centralized analyst. Now, there are no backlogs and the number of phones analyzed has soared 584% year over year. Our new mobile forensic system helps us to fulfill our mission daily… By extracting and analyzing more devices, the TDOC Office of Investigation & Compliance can reduce violence and contraband introduction statewide in a more timely fashion. 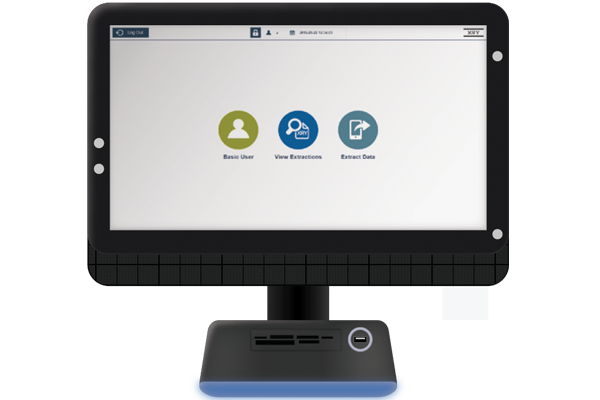 The MSAB Kiosk is designed to enable front-line law enforcement and corrections officers to quickly and easily extract information from mobile phones. Like most state prison systems, Tennessee has been fighting a battle to control the flow of contraband phones into inmates’ hands and manage the large number of hardened gang members within their population. When phones were confiscated, they were sent to Nashville for processing. In some months as many as five boxes of phones would arrive, containing hundreds of phones each. In urgent, high-profile cases, phones would be driven to the Nashville office – and Tennessee is 482 miles long – consuming many hours of employee time and resources. The phone processing backlog had the heaviest impact on the Department’s investigators, who are responsible for investigations within the system, with a focus on preventing outbreaks of violence by gang members, preventing gang members from communicating with other criminals outside the prison system and identifying corrupt staff members. Phones contained critical intelligence that was needed quickly. The processing backlog was a major issue impeding their work. In early 2017, the Tennessee DOC began working with MSAB to implement a better system. The DOC staff worked with MSAB’s Professional Services team to define the challenges to be solved, the goals to be achieved and other requirements. Eight easy-to-use Kiosks were installed, one in each state-owned prison (with the exception of two Nashville units which are within a mile of each other), plus five XRY Office applications on standard PCs. The Kiosks are computers with “wizard-like workflows” that make it easy to extract phone data by following simple steps. Every investigator received one day of training, enabling them to manage the extractions successfully in almost every case. Speed improved dramatically vs. the previous technology used. The number of phones processed increased by 584% year to date in 2017 vs. the same period in 2016. Reports on phones processed, gang intelligence gained, phones seized from inmates, staff and visitors are output in real time. Now, investigators are getting updated intelligence and evidence with no delays. This is paying off in a number of ways, such as enabling the identification of high-ranking gang members, helping prison officials isolate and/ or house them safely. Through the timely analysis of phone data, investigators are also able to look for evidence of potential attacks on staff members. And based on this success, the state Pardons & Paroles employees have begun using MSAB technology as well. Tennessee is still a long state, but there are no longer long waiting times for mobile phone processing in the Tennessee DOC.